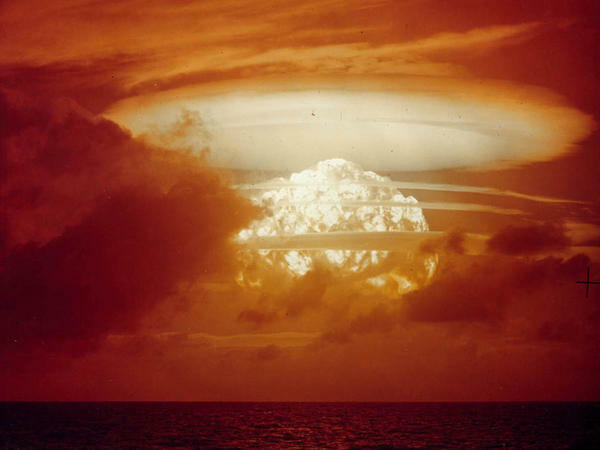 On March 1, 1954, the U.S. conducted its largest nuclear test with a yield of 15 megatons. The new Russian weapon would be up to 100 megatons, according to reports. Status-6 made its first public appearance in 2015, on a television broadcast of Russian President Vladimir Putin meeting with his generals in the city of Sochi. But buried in the plan is a mention of a mysterious Russian weapon called "Status-6." On paper, at least, Status-6 appears to be a kind of doomsday device. The report refers to it as "a new intercontinental, nuclear-armed, nuclear-powered, undersea autonomous torpedo." "The radius of total or near-total destruction is the size of a pretty large metropolitan area, actually," says Edward Geist, a Russia specialist at the Rand Corp. who has spent time looking at the weapon. "It's difficult to imagine in normal terms." Russia state television reported on the visit. The camera shows Putin seated at a long table. Then it cuts to a shot over one of the general's shoulders. He is looking at what appears to be a drawing of a new nuclear weapon called the Oceanic Multipurpose System Status-6. Status-6 looks like a giant torpedo about a third the length of a big Russian submarine. According to the slide, it is nuclear-powered, meaning it can roam for months and possibly even years beneath the ocean without surfacing. Its payload is a nuclear warhead "many tens of megatons in yield," Geist says. That is thousands of times more powerful than the bombs dropped at the end of World War II and more powerful than anything currently in the U.S. and Russian arsenals. "The only possible U.S. targets are large port cities," says Mark Schneider, a senior analyst with the National Institute for Public Policy, wrote in an e-mail. "The detonation of Status-6 in any of them would essentially wipe out their population into the far suburbs." "The detonation would cause a very large amount of radioactive fallout," adds Pavel Podvig, an arms control expert who runs a blog called Russian Strategic Nuclear Forces. Podvig believes the weapon could potentially bathe the entire Northeast Corridor in radioactive soot. Status-6 would probably be used as a "third-strike" weapon of last resort. If Russia fell under attack from the U.S. and couldn't retaliate with its missiles, it might trigger Status-6: a doomsday machine. Or at least a doomsday-ish machine. Then again, the whole thing might be a fake. "The drawing of this drone looks more like an enlarged drawing of a smaller torpedo," says Podvig. In other words, it looks as if the Russians may have just taken some torpedo clip art, blown it up to terrifying size and then broadcast it on state television. "It's a way to get our attention," says Geist. Geist says that the "leak" of Status-6 was deliberate. Russia worries that U.S. missile defenses might be able to shoot down its missiles in a nuclear war. By showing a plan for Status-6, Russia is warning the U.S. that if it continues to build such defensive systems, then Russia will find another way to strike, with a missile that can't be intercepted. "My read of the whole Status-6 slide leak is that the Russians were trying to send us a message," Geist says. Podvig agrees that the leak of Status-6 is probably just a warning shot. But the fact that it appeared in the Pentagon's newest report on nuclear weapons shows that some war planners are taking the idea seriously. There may be some politics involved in that decision as well, says Hans Kristensen of the Federation of American Scientists. The Trump administration is pushing hard for upgrades to America's nuclear arsenal. In his State of the Union address, the president called for making the arsenal "so strong and so powerful that it will deter any acts of aggression by any other nation or anyone else." Citing Status-6 helps to build the case that upgrades to American nukes are needed, Kristensen says. For all the rhetoric around Status-6, Podvig and Geist both believe that the program isn't completely made-up. Geist says a long-range underwater drone without a nuclear warhead would be a useful weapon. "You could use it for tapping our underwater communications cables," he says. "Or simpler, in a war, is just going out and like finding them and cutting them." Status-6 could also carry conventional munitions, like cruise missiles, and launch them after hiding for months beneath the water. Podvig has seen photos that he says indicate the Russians are working on some hardware for big underwater drones. "My best guess is that there is there is a project to design an underwater vehicle with a purpose, unknown at this point," he says. "There is something there." Today the Trump administration released a report on America's nuclear weaponry. Most of the assessment was of the Pentagon's nukes and missiles, but buried in the plan was also mention of a mysterious Russian weapon called Status-6. NPR's Geoff Brumfiel reports that Status-6 appears to be some kind of a doomsday device if it's real. GEOFF BRUMFIEL, BYLINE: Status-6 made its first public appearance two years ago. Edward Geist is with the RAND Corporation. EDWARD GEIST: Putin was receiving a briefing from his generals when he was on a visit to Sochi. BRUMFIEL: Russia state television reported the visit. The camera showed Putin seated at a long table with his generals. And then it cuts to a shot over one of the general's shoulders. He's looking at a drawing of a weapon. Now, it seems like the camera just happened to catch the drawing, but Geist says this was no accident. GEIST: Our general consensus is that this was very intentional. This is all very engineered by the Russians. BRUMFIEL: The drawing appears to be a new nuclear weapon, a weapon far more powerful than anything in the U.S. or Russian arsenals. Its name? GEIST: The Oceanic Multipurpose Systems Status-6 (ph). BRUMFIEL: Status-6. It looks like a giant torpedo about a third the length of a big Russian submarine. GEIST: The specification on the slide - this thing is faster than most or all of our torpedoes. It's supposed to operate at a depth greater than our submarines can go. BRUMFIEL: It's nuclear-powered, so it can travel thousands of miles underwater without surfacing. If the slide is to be believed - and we'll talk more about that in a second - then Status-6 would launch from beneath a Russian submarine. It would shoot under the ocean at a depth too deep to be intercepted and then incinerate a U.S. coastal city. GEIST: In terms of the sheer destructiveness of such a weapon, it's - I mean, it's a little - it's difficult to imagine in normal terms because the radius of total or near total destruction is the size of a pretty large metropolitan area, actually. BRUMFIEL: Pavel Podvig, who runs a blog called "Russian Forces" (ph), says the size of the bomb might also cause radioactive fallout on a massive scale. PAVEL PODVIG: This fallout would spread over - I think that we're talking about the kind of northeast corridor in the U.S.
BRUMFIEL: Washington to Boston bathed in radioactive soot. Status-6 would probably be used as a weapon of last resort. If Russia fell under attack from the U.S. and couldn't retaliate with its missiles it might trigger Status-6, a doomsday machine. Then again, the whole thing might be a fake. PODVIG: The drawing of this drone looks more like a enlarged drawing of a smaller torpedo. BRUMFIEL: A standard Russian torpedo. 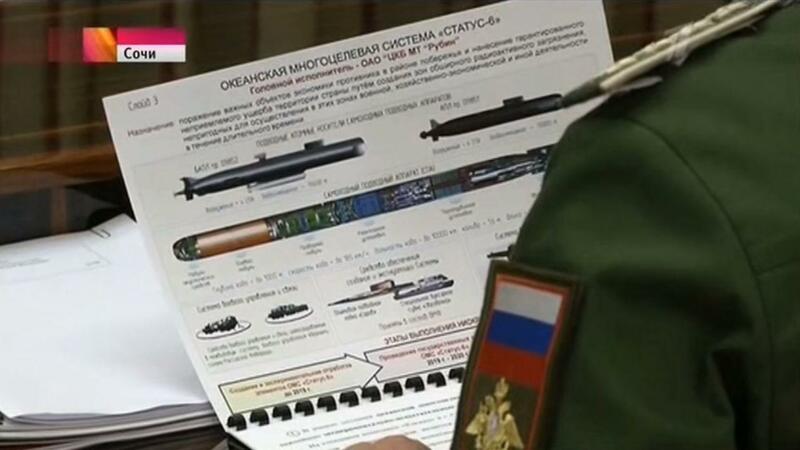 In other words, it looks like the Russians may have taken some torpedo clip art, blown it up to terrifying size, and then broadcast it on state television. Why? GEIST: It's a way to get our attention. BRUMFIEL: That's Edward Geist from RAND again. Geist says that Russia is worried about U.S. missile defenses. They fear that the U.S. might be able to shoot down their missiles in a nuclear war. That would upset the nuclear balance of power. GEIST: So my read of the whole Status-6 slide leak was that the Russians were trying to send us a message. BRUMFIEL: Keep building missile defenses, they're saying, and we'll find another way to hit you, one you can't shoot down because it's underwater. Podvig agrees the leak of Status-6 is probably just a warning shot. But the fact it appeared in the Pentagon's latest report on nuclear weapons showed that some war planners are taking the idea seriously. And Podvig and Geist also say they think the program isn't completely made up. Geist says a long-range underwater drone without a nuclear warhead would still be a useful weapon. GEIST: You could use it for all sorts of things. You could use it for, like, tapping, say, our underwater communications cables. Or simpler in a war is just going out and, like, finding them and cutting them. BRUMFIEL: Russia's been working on deep water drones for decades, and Status-6 may be a significant new program if it exists. Geoff Brumfiel, NPR News, Washington. Transcript provided by NPR, Copyright NPR.